It will take some time for the technology to advance to the consumer level, Ning said. Composition-graded nanostructures on a single quartz substrate. a, Real color image of the as-grown full composition-grade sample under ambient lighting. The light grey and black regions on the substrate represent the ZnSand CdSe-rich compositions, respectively and the intermediate colors are associated with the quaternary alloys of intermediate compositions. Scale bar only for the width direction, 0.25cm. b and c, PL images of the region between the dashed lines under 10X (b) and 50X (c) of magnification . The sample was pumped by a 405 nm continuous wave (CW) laser diode. d, Cross-sectional SEM images from six representative points along the substrate, within the region between the dashed lines in a. Scale bars, 10m. e, EDS results from fourteen evenly-spaced points between the dashed lines in a, moving from left (ZnS-rich) to right (CdSe-rich). f, Corresponding EDS spectra of several points in e.
Li-Fi is a bidirectional, high speed and fully networked wireless communication technology similar to Wi-Fi. Li-Fi is a subset of optical wireless communications (OWC) and can be a complement to RF communication (Wi-Fi or Cellular network), or a replacement in contexts of data broadcasting. LED based Li-Fi should be able to get hundreds of megabit per second communication speed. White Laser based Li-Fi should be able to get hundreds of times faster than LED based Li-Fi. Monolithic semiconductor lasers capable of emitting over the full visible-colour spectrum have a wide range of important applications, such as solid-state lighting, full-colour displays, visible colour communications and multi-colour fluorescence sensing. The ultimate form of such a light source would be a monolithic white laser. 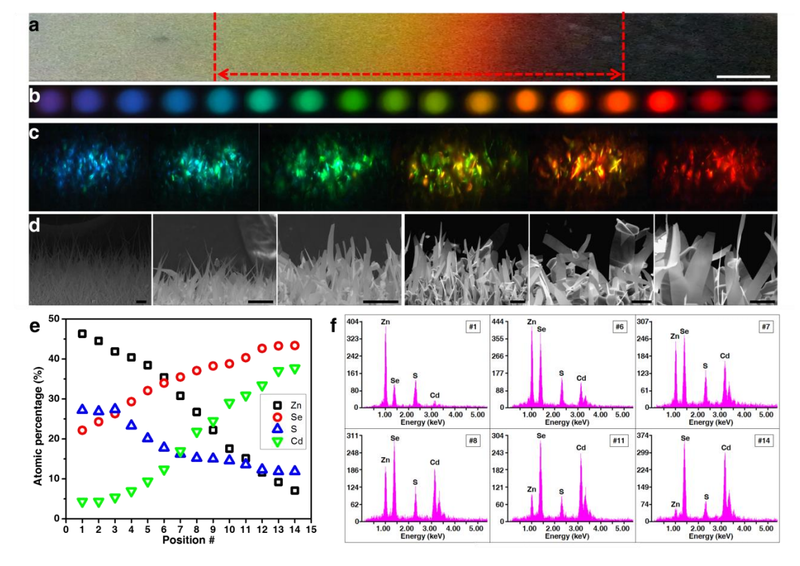 However, realizing such a device has been challenging because of intrinsic difficulties in achieving epitaxial growth of the mismatched materials required for different colour emission. Here, we demonstrate a monolithic multi-segment semiconductor nanosheet based on a quaternary alloy of ZnCdSSe that simultaneously lases in the red, green and blue. This is made possible by a novel nanomaterial growth strategy that enables separate control of the composition, morphology and therefore bandgaps of the segments. Our nanolaser can be dynamically tuned to emit over the full visible-colour range, covering 70% more perceptible colours than the most commonly used illuminants.